While browsing through jewellery store displays, do you think that all rings seem to look the same? If you crave for something you can never find on racks and that’s embellished and designed nothing like others—or perhaps you have a stone of your own but no setting and band—consider having your engagement ring custom-made. If you wish to don a ring that’s designed only for you, here are some essential pointers to keep in mind. It takes serious amount of time to find out how you really want your proposal ring to look like. To get the planning started, determine the design you want. Note which colour of stones and metals you find yourself attracted to. Are there eras of style that most of your jewelleries take after (i.e. Victorian, art deco, modern minimalism, etc.)? What design of this era does appeal to you the most? Also, notice what elements you like on other people’s rings. Check out several jewellery stores and try on different ring styles. Spend some time browsing through Pinterest to find inspiration for your custom-ring. After you have identified the elements you want to have on your ring, try sketching the ring as detailed as you possibly can, and don’t forget to take note of the details you don’t like as well. Your lifestyle will also help determine the style of your jewellery. Depending on your day to day activities, you may want something that’s less protruded and clunky. If you are a more active person—say you’re an athlete or you go to the gym more often—a bezel setting would be a more ideal and secure setting than the common prong setting. Also, consider the wedding ring. Work with a jewellery designer to create an engagement ring that looks spectacular when complemented by a wedding ring but also looks just as stunning when worn alone. A piece of advice: if you want your engagement ring to look complementary with your wedding band, purchase the rings together from the same jeweller. Do your homework and research on the type of stones and metals that fit your budget. Look into the different types of precious metals for a customized wedding ring in Singapore such as platinum, silver, white gold, titanium and tungsten. For the diamond consider the 4Cs (cut, colour, clarity and carat) and the substitutes like cubic zirconia, white sapphires and other gemstones. As you learn more about the options available for you, discuss this with your jeweller. Work together to come up with a combination of precious metals and stones that will fit your budget while also considering the design you desire. The sky is the limit when it comes to designing your own engagement ring, although a few requirements have to be met. 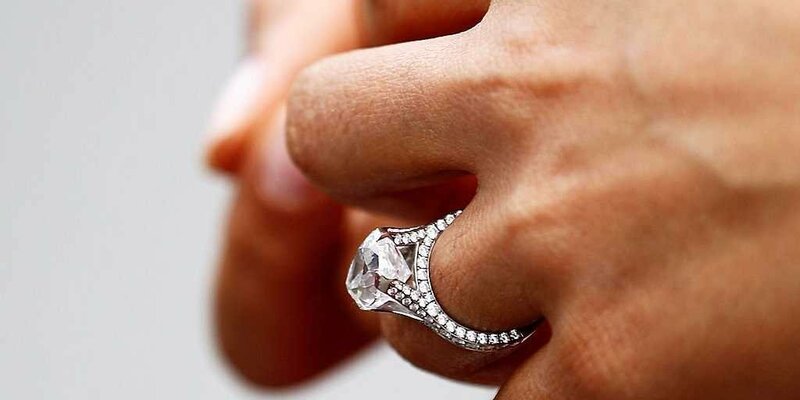 As mentioned, diamond is not the only stone you can use on your ring. You can use pearl, your birthstone or other gemstone—or nothing at all. The same goes with the band. Silver and gold are not the only metals you can use for your ring’s band. Tungsten, for instance, is a much more durable substitute for a fraction of a price. Also, if you’re planning on customizing your wedding bands but you and your fiance can’t seem to agree on the same design, you can always go for different styles of wedding rings. But try to agree on at least one element to somehow tie the look of the rings together. You would want to work with a reputable and trusted designer—someone who can provide excellent customer service and quality product. Start by asking around family and friends for recommendations. When contacting a jeweller in Singapore, ask about their affiliations, how long they have been in the business and if you can view their recent works. Ultimately, you want to work with a professional who will not only listen and provide your needs and wants, but also can give suggestions in order to come up with quality product. A skilled jeweller has good sense of logistics and can provide you with relevant suggestions for creating a practical ring setting. This is not something that can be rushed. It takes significant amount of time to come up with a design, find a good jeweller to work with and actually start the creation process—not to mention the additional time needed for modifications. Once you have decided on a design, your jeweller will create a mock-up of your engagement ring—either made of wax, metal cast or by CAD (computer-aided design). If the first mock-up needs more tweaks, expect that it will take another week—or more—to create a new one. After approving a design, it will take some more time to create the actual ring. Over all, the back-and-forth process of making modifications and agreeing on a design could take months to complete. A custom-made proposal ring is a great opportunity for you to incorporate your individuality into the most significant piece you own in your life. It is the perfect way to incorporate designs that represent you, as well as stones that were passed down through generations in your family. With creative mind and the right jeweller, it’s not impossible to bring your dream ring to life.